Könnyű, de intenzív hidratáló krém normál és száraz bőrre. A krém fantasztikusan üde és élénk hatással bír a bőrön. 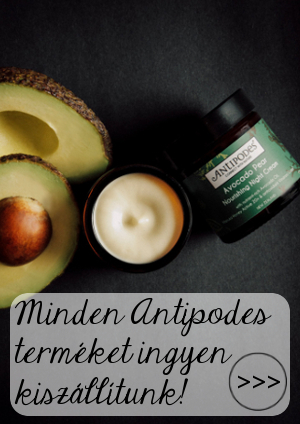 Antipodes Vanilla Pod Hydrating Day Cream contains 100% pure avocado pear oil with Vitamins A, B, C, E as well as chlorophyll and Omegas 3, 6 and 9 - all excellent antioxidants. This incredibly moisturising and nourishing cream will see you through each and every day with radiance. African karite butter glides the creamy texture of Vanilla Pod Hydrating Day Cream on to your skin, and keeps it supple and protected. Plus it's easily absorbed by the skin for maximum hydration thanks to an extract from Spanish olives, squalane; a unique moisturising agent with a high affinity to your skin's own oils. It also includes manuka honey, to soothe and nourish skin, and an antioxidant-rich extract from the leaf of the native New Zealand plant kawakawa. azaz egyetlen csepp rózsaolajhoz ezernyi kézzel szedett rózsaszírom szükséges.